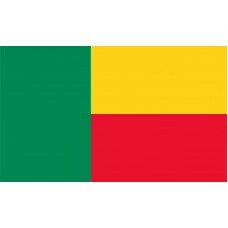 The Benin flag consists of a green rectangle that runs vertically top to bottom on the left side opposite two horizontal rectangles that make up the right-hand side of the flag. The upper one is yellow and the lower red and they are of equal proportions. 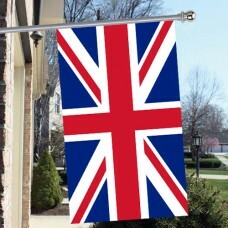 Due to the frequently-changing political climate, the flag has seen many changes over the years. The current flag design was first adopted on November 16th, 1959 when the country gained independence as the Republic of Dahomey in 1960. In 1975, new leadership emerged who changed the countries name to People's Republic of Benin and changed the flag to a green flag with a red star in the upper left corner. 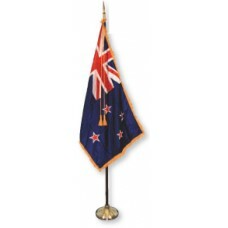 In 1990, a revolution took place which toppled the leadership and restored the flag to its prior design. 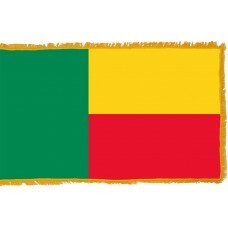 The red rectangle of the Benin flag is a representation of the soil or the blood of the ancestors, the yellow color represents the savannas, and the green color represents palm trees. The current Benin flag is actually most accurately attributed to The People’s Republic of Benin which was formed as a multi-party democracy in 1991. The country retained the name of “Benin” which refers to an ancient African Empire that existed in the area. Situated in West Africa, against the border with Togo, Benin has a long history associated with the slave trade and the citizens are known as "Beninese." This association with the slave trade has resulted in the central region becoming known as the Slave Coast. The coast forms a part of the Gulf of Guinea at the most northerly tropical part of the Atlantic. Between 1900 and 1958, the area was part of a French colony and Benin is credited with being the first country to shift from dictatorship to democracy in the 1990's. The region initially suffered from several bouts of political instability including multiple military coups and dictatorship. The main export from Benin is cotton which contributes towards what little economic growth the region has enjoyed in recent years. This is set against a poor infrastructure and a political and public system that continues to suffer from corruption. The country has a large population and there are often tension points along its border with Burkina Faso concerning land disputes between rival communities. French is the country's official language but over half of the population speaks African dialects that include Bariba, Yoruba, Mina, and Dendi. English is also taught to secondary school students along with French as the countries two secondary languages. Previously exiled Patrice Talon returned to Benin in 2015 following a pardon in 2014 and was elected as the country's president in March of 2016. With political corruption and sporadic unrest in Benin, it is difficult to ascertain the true state of the country. Several newspapers have been suspended and journalists are not warmly welcomed in Benin. The capital city of Benin, Porto Novo is the home of the country's airport and the main port city. The landscape is tropical and features the representations of the palms and savannas as depicted in the Benin flag. The yellow foretells the greatest treasures. Enjoy abundance and happiness forever.